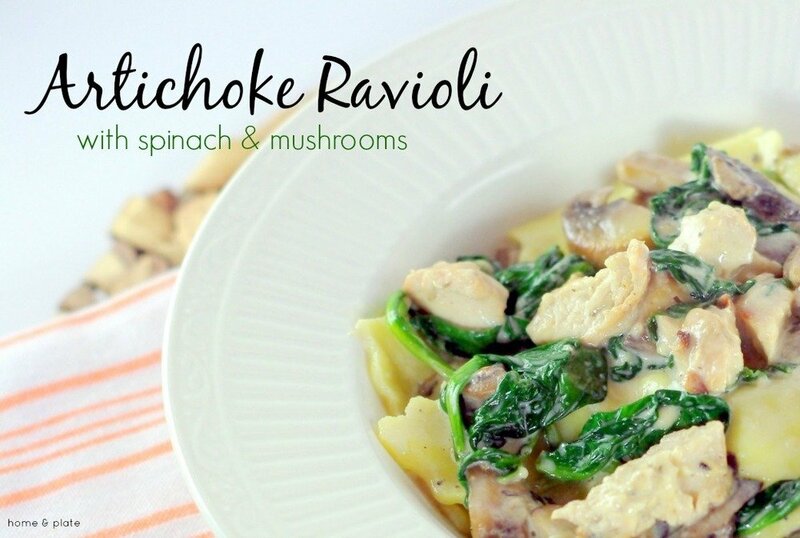 My Artichoke Ravioli with Spinach & Mushrooms can be on the table in 30 minutes. 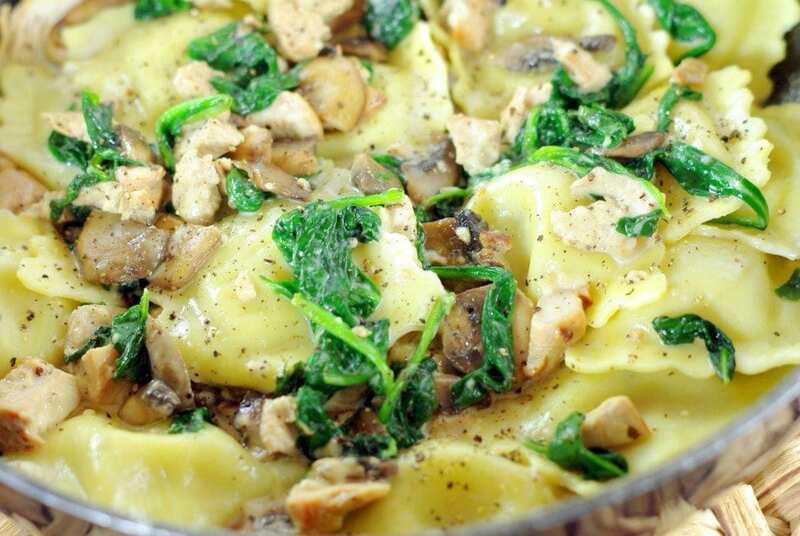 Add spinach, tender chicken and mushrooms for a delicious dinner. How does this sound for dinner? 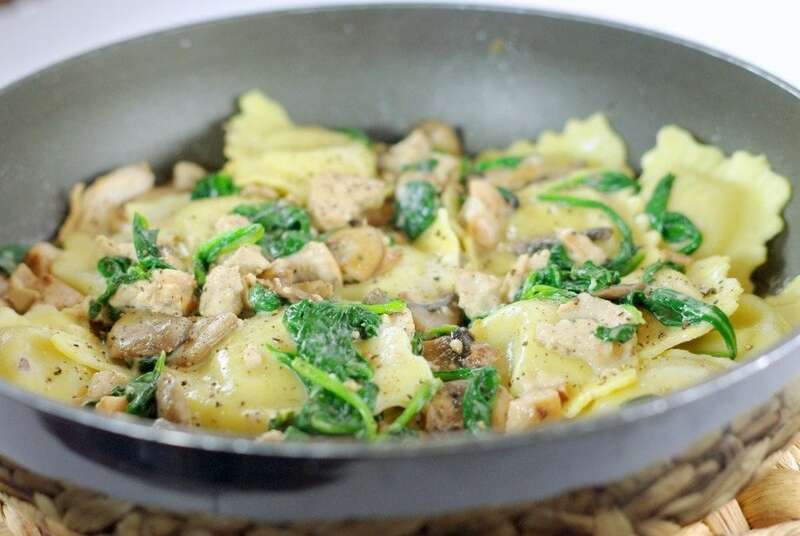 Creamy artichoke ravioli with wilted fresh spinach and caramelized mushrooms tossed with tender grilled chicken. You don’t have to be a professional chef to whip up a delicious, gourmet meal in minutes. You just need to have some leftover grilled chicken from the night before, some fresh vegetables in your fridge and a little bit of cream and Parmesan cheese. Buying fresh pasta like ravioli or tortellini at the grocery store is convenient for these quick meals. It comes stuffed with an assortment of different meats, cheeses and vegetables. Just select what sounds good. For this recipe I chose artichoke ravioli by Rana. Then you just have to figure out what to mix in to make your gourmet meal. You just have to get creative. 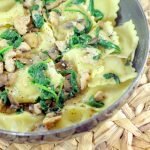 I had spinach and mushrooms in my vegetable bin but this recipe would be delicious with asparagus, zucchini and squash too. 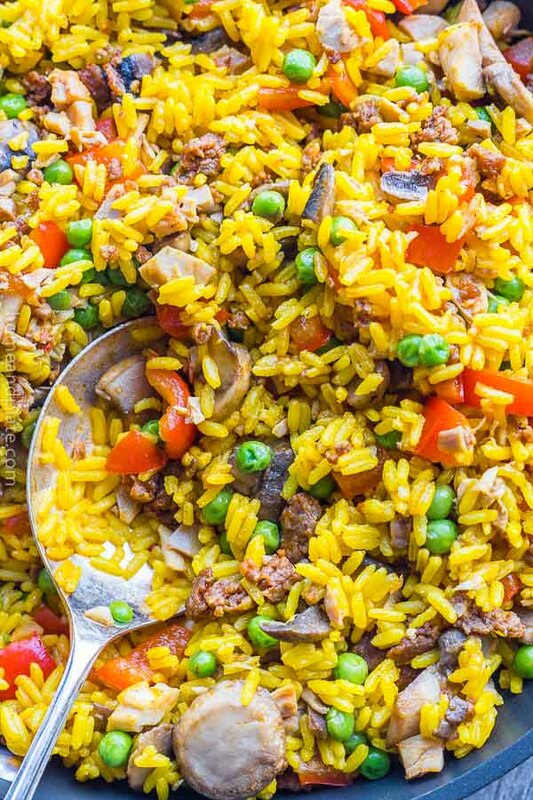 Fixing a weeknight meal that is quick and delicious is easy. What do you like to mix in with your pasta? Melt the butter in a large skillet pan. Add the mushrooms and sauté until caramelized, about four minutes. Add the spinach and garlic and stir until the spinach has wilted. Stir in the chicken. Meanwhile cook the ravioli according to the package instructions. In a small saucepan, stir the milk, cream and Parmesan cheese until slightly thickened. Add salt and fresh ground pepper to taste. 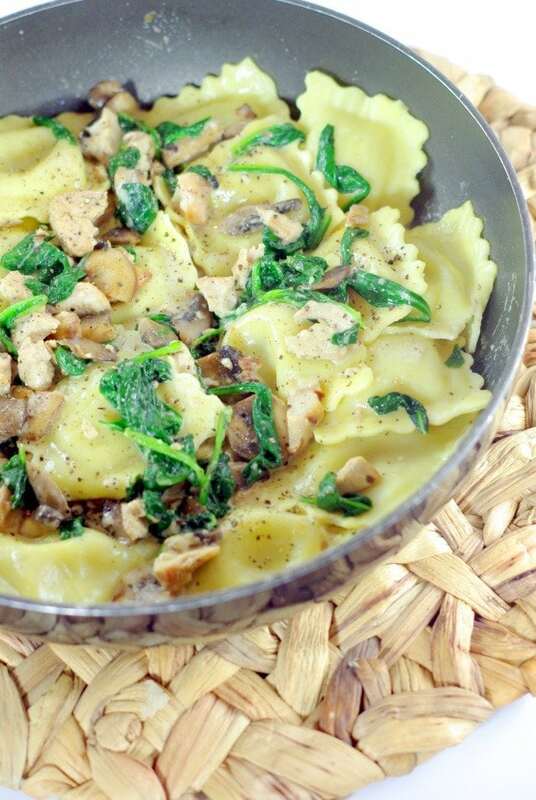 Then add the ravioli and the cream sauce to the mushrooms and spinach mixture and stir to coat all ingredients. so fresh and bright! these flavors sound great! And delicious too. 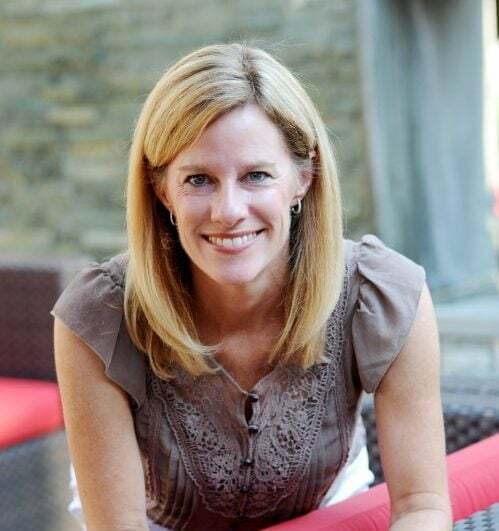 Thanks Kristina! Oh yum!! This ravioli sounds so good! It’s so rainy and cold here in Virginia, this sounds like the perfect recipe to warm up 🙂 YUM! Thanks Liz. My folks are in NC and the rain from the hurricane is really putting a damper on things. Hope this pasta warms you up! Thanks. I agree. It is pure comfort in a bowl. I have had mushroom ravioli. I’ve had spinach ravioli. But I’ve never had artichoke ravioli. I’m so jealous. Where can that brand of ravioli be bought? This looks like just the kind of dish I’d love.